Tweets, broken English, angry carebears, and victory. What do these things have in common? It can only be @NewOrderGamis! Agent Kalorned is a man on a mission. He's done such a good job supervising the miners of the Gamis system that a promotion was inevitable. With the latest additions to the New Order diplomatic corps, it won't be long until everyone in the EVE community loves us. Kalorned has made a name for himself, especially in Gamis. Does a particular highsec system hold a special place in your heart? Join the New Order and begin enforcing the Code there. You'll become breathtakingly powerful, and an instant celebrity. 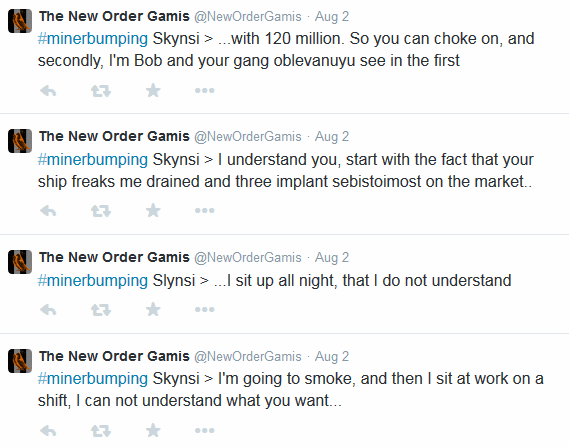 Like all celebrities, Agents of the New Order get trash-talked by the occasional critic. And yet heroes like Kalorned keep calm and carry on with the Code. Amazing fortitude. When your enemy tells you to commit suicide, it means he knows he can't kill you himself. Agents of the New Order are known for their invincibility, so remarks like Mazakjr's are commonplace. We talk about gankers a lot on MinerBumping, but this blog was founded on the truths revealed through the bumping of miners. Kalorned carries a torch for the traditional art of miner bumping. When you bump a miner, you impart an extraordinary gift upon him or her: You're providing the miner with emergent content. They usually don't realize you're doing them a favor until after the bumping stops, though. Techlon has been mining in highsec for more than five years. He's developed a lot of bad habits in that time, and he's collected a lot of misinformation. You'd be surprised how often miners assume I've been permabanned. In fact, it came up in one of the very first MinerBumping posts ever, back in August 2012. When a miner had trouble linking my name in local, he started telling everyone I must have been banned. The rebels haven't gotten any smarter since then. Among the rebel miners, conspiracy theories are more widely consumed than actual news is. The more baffling and nonsensical the theory, the better. These days many rebels honestly believe MinerBumping is secretly written by someone else. Why wouldn't I write my own blog? Who does write it? Is The Mittani somehow to blame? Or the NSA? One can only guess. Kalorned and his ganker alts, listed by penelope pissy-pants, have improved Gamis a great deal. The bots and bot-aspirants don't like this. 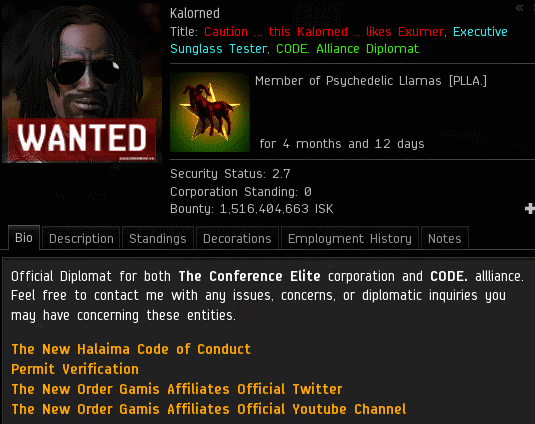 Maybe he's my alt, maybe we're all banned, or maybe--just maybe--Kalorned is an informant for CCP. Confusion is a carebear's default state. The only cure is a steady diet of truth. Every carebear in highsec needs to read MinerBumping each day. For best results, they should read the Code a few times a day, too. You wish you had bigger letters, right? I just hope I played a part in getting some miners compliant for good. tsk tsk codies are an endangered species, killed by CCPs golden ban-hammer. You had it already coming when stating you idiots where game-masters. Kalorned may be an alt of Jimmy the whiny but no CCP guy for sure. ROFL, the only one who compares narcistic jimmy with mittens is jimmy. You wish, but youre not even close. We are all alts of James 315 ..... even you anon @ 8:29.
sure, and you always win, even when you get banned. Since it is still there. I created a support ticket, made a screenshot of the text that hints CCP code connections and cited the text and the link. Lez see what CCP thinks when Kalorned --miiiight-beeee--- a CCP agent. Maybe someone will get another nice letter from CCP! who is tweeting that crap anyways? most likely ALL are alt of kalorned! Not wonder he wins! Kalorned, you've been an example to me from the start. Your playstyle is one I've tried to emulate, and your videos are truly inspirational. As an Agent and a Knight of the Order, you speak with the voice of authority. It seems only natural then that you should become a Diplomat. Congratulations! you got some bad breath! My time on deployment in Gamis was thoroughly enjoyable, not least beause of the mentoring and friendship of Agent Kalorned. He is both a gentleman and a ruthless enforcer of The Code, and will make a fine diplomat. Congratulations, my friend. Aren't RL threats a bannable offense or is that punishment just reserved for certain individuals ? An invincible stabber is truly invincible. There has never been a record of one being lost, except due to such external factors as "Pilot Error" or "Lag". I like to mine, I like to build stuff, I like to gank miners that get in my way, because business is business, i despise botters, i do not particularly like ISboxer, hmmm afkr's....even when their lasers are going...no answer in chat or on TS in a corp that I operate...i take our rocks and dock your pay. Spai's, its part of the game...avg wow like player has no idea how to do intelligence or counter intelligence....they can be taught...but most are so unsociable they will never understand EvE or at least scrub their way along. ISK...its a tool a means, now assets...hmmm 3 trillion in PLEX sitting in a hangar and as the prices rise every year i get richer....i dont play for ISK...the ones that do...either RMT or well they aint carebears they are less than that. I do not support CODE but really a lot of you stuck on phonics need to wake up because they arent the only ones looking at you as a meal. Half of these antiganker trolls can barely form coherent sentences.